Cadence offers complete plastic injection molding capabilities that couple with many of our metals components or subassemblies. 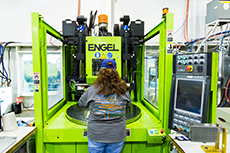 We also offer injection molding in three of our four facilities to help reduce lead time and costs for our customers. Two-shot molding is designed to mold and “overmold” within a single cycle. In the first step, material is molded into a basic shape. Then the second material is injected into the remaining open spaces, often providing a different color and texture. Two-shot molding provides a low cost, performance-driven solution for high volume programs traditionally supported by plastic on plastic insert molding. Two-shot molding eliminates work-in-process inventory and direct labor content while improving process reliability and consistency. Due to the unique part design requirements needed for the two shot molding process, our engineering resources are available early in the development cycle to advise our customers on incorporating two shot molding design requirements into their concepts. Insert molding, also known as overmolding, is a unique capability for Cadence. Our newest 60-ton presses have two-station rotary table configurations that are optimized for the manual or automated insert molding of sharps. The overmolding capability allows us to have full “in-house” and captive control of all of the downstream processes needed for completion of the sharp devices we produce. 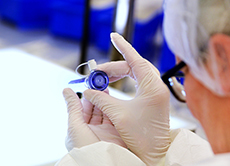 We also now have clean room injection molding capabilities for use, when needed.